Dapsone can rarely cause a hypersensitivity reaction called dapsone syndrome, consisting of fever, hepatitis, exfoliative dermatitis, lymphadenopathy and hemolytic anemia. Dapsone syndrome is a manifestation of the DRESS (drug rash with eosinophilia and systemic symptoms) syndrome which is a serious condition that has been reported in association with various drugs. Cholangitis in dapsone syndrome has not been reported so far in the world literature. We report a patient who presented with fever, exfoliative dermatitis, jaundice and anemia within three weeks of starting of dapsone therapy. These features are typical of dapsone syndrome, which is due to dapsone hypersensitivity and is potentially fatal. Unlike previous reports of hepatitic or cholestatic injury in dapsone syndrome we report here a case that had cholangitic liver injury. It responded to corticosteroids. 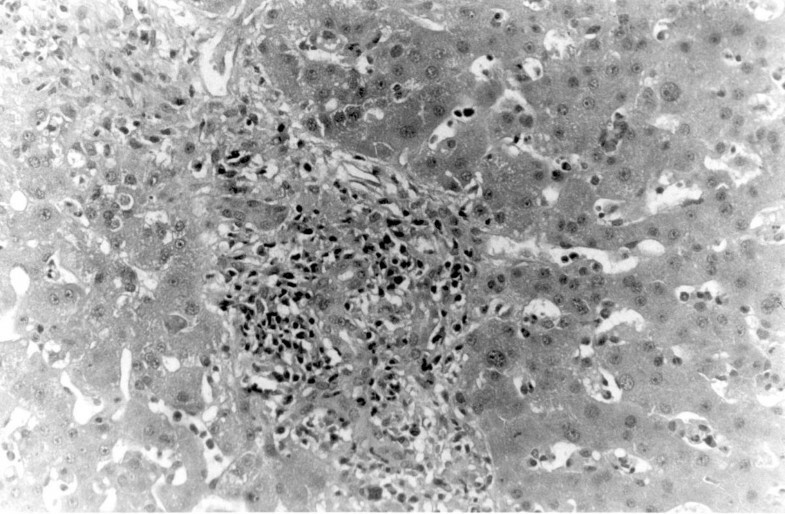 We conclude that cholangitis, though unusual, can also form a part of dapsone syndrome. Physicians should be aware of this unusual picture of potentially fatal dapsone syndrome. Dapsone can rarely cause a hypersensitivity reaction called dapsone syndrome consisting of fever, hepatitis, exfoliative dermatitis, lymphadenopathy and hemolytic anemia occurring within 3–6 weeks of starting dapsone. With increasing usage of dapsone this syndrome has been reported in cases other than leprosy such as Pneumocystis carinii pneumonia in AIDS patients  and pemphigus . We report a patient with dapsone syndrome in whom liver histology was suggestive of acute cholangitis. A 40 year old man presented with fever, jaundice and pruritic skin rash of 10 days duration after receiving dapsone (100 mg/day) and clofazimine (100 mg/day) for three weeks along with one dose of rifampicin (600 mg). There was no pain abdomen or clay colored stools. He had suffered from urticaria for many years. Since there was no response to desensitization techniques or to fexofenadine for two years, the above treatment was prescribed to him empirically by his general physician suspecting leprosy. Examination revealed icterus, pallor, and small left cervical lymph nodes. There was no edema of face or limbs. He was hemodynamically stable. The skin showed erythematous maculopapular rash all over the body with predominant involvement of trunk and lower extremities. There was no mucosal involvement. Systemic examination was unremarkable except enlarged liver (6 cm below costal margin in midclavicular line). Laboratory investigations revealed Hb 8 g/dL, TLC 8300/mm3, DLC neutrophils 62%, lymphocytes 32%, eosinophils 6% and ESR 57 mm in 1st hour. Peripheral blood picture showed polychromasia and anisocytosis. The corrected reticulocyte count was 3%. Liver function tests revealed total bilirubin 14.4 mg/dL with a direct of 6.7 mg/dL, AST 58 U/L, ALT 127 U/L, alkaline phosphatase 141 U/L, serum albumin 2 g/dL and prothrombin time 10.4 s against a control of 10.8 s. Serological tests for hepatitis A virus (anti-HAV IgM), hepatitis B virus (HBsAg), hepatitis C virus (anti-HCV) and hepatitis E virus (anti-HEV IgM) were negative. C3 and C4 were on lower side of normal. Autoimmune markers (ANA, ASMA, AMA and anti-LKM antibodies) were negative. Ultrasound abdomen, done twice, did not show any evidence of biliary obstruction. There was uniform enlargement of liver with normal echo-texture, and no evidence of portal hypertension. Contrast enhanced CT scan of abdomen showed similar findings. Liver biopsy (Figure 1) showed largely maintained lobular architecture with focal steatosis and dilatation of sinusoids. Portal tracts revealed edema and infiltration by mixed inflammatory infiltrate. There was focal destruction of bile ducts and presence of intraepithelial neutrophils suggestive of cholangitis. Skin biopsy (Figure 2) was also done which showed lymphocytic vasculitis consistent with drug-induced, non-specific dermatitis with superficial candidiasis. There was no evidence of leprosy in skin biopsy. Dapsone was stopped at admission. Rifampicin and clofazimine were also stopped, as there were no skin lesions suggestive of leprosy. Patient was treated with antipyretics, broad-spectrum antibiotics and hydrocortisone. With this the patient improved. Fever showed a declining trend within forty-eight hours and disappeared completely in four days. Rash was replaced by marked exfoliative dermatitis which disappeared with desquamation. No fresh lesions appeared thereafter. Liver size regressed and became normal in seven days. Bilirubin declined from 14.4 mg/dL to 3.5 mg/dL in two weeks. Patient was discharged in two weeks. Dapsone (4,4'-diaminodiphenylsulfone) is the parent compound of the sulfones. It has been the drug of choice for the treatment of leprosy since the middle of the 20th century . It has also been employed for the treatment of dermatitis herpetiformis and other dermatologic conditions and Pneumocystis carini infection (in combination with trimethoprim) in patients with AIDS. Adverse reactions to dapsone and other sulfones include dramatic, generalized hypersensitivity syndrome termed as 'dapsone syndrome'. This syndrome has a frequency of 0.2% – 0.5% in patients on dapsone therapy . The constellation of features included in this syndrome is fever, exfoliative dermatitis, lymphadenopathy, lymphocytosis, methemoglobinemia, hemolytic anemia and hepatotoxicity. It may appear in an incomplete form as hepatitis  or exfoliative dermatitis . Dapsone syndrome can be considered a manifestation of the so-called DRESS syndrome. The DRESS (drug rash with eosinophilia and systemic symptoms) syndrome is a serious condition that has been reported in association with various drugs, such as anticonvulsants, sulfonamides, dapsone, allopurinol, minocycline and gold salts . Hyperbilirubinemia present in dapsone syndrome may partly be due to hemolysis in addition to hepatotoxicity. Both hepatocellular and cholestatic injury have been described . Hepatocellular injury is characterized by elevated transaminases with liver biopsy showing predominantly eosinophilic lobular and portal infiltration. Hepatitis may progress to liver failure and death [9, 10]. Cholestatic pattern may have less severe course and is characterized by high alkaline phosphatase level and modest transaminases level. The liver biopsy may show granulomas [11, 12]. The mechanism of injury, including hepatotoxicity in dapsone syndrome, seems to be hypersensitivity reaction [5, 11, 13–15]. Severe cases require corticosteroid therapy, to which it responds well. Dapsone induced agranulocytosis is another important side effect of dapsone . This is a severe idiosyncratic reaction resulting in a neutrophil count of less than 500/mm3, which usually occurs in older individuals after 1–3 months of therapy. Dapsone induced agranulocytosis and dapsone syndrome are two different side-effects of dapsone. Most patients with dapsone induced agranulocytosis do not simultaneously have dapsone syndrome. The hematologic toxicity of dapsone (methemoglobinemia, hemolysis and agranulocytosis) is mediated by cytochrome P-450 induced metabolism of dapsone to hydroxylamines. The erythrocytes exposed to hydroxylamines reach bone marrow where they release hydroxylamines in sufficient concentration to kill the granulocyte precursor leading to agranulocytosis . Our case had all the features of dapsone syndrome. His symptoms appeared within three weeks of starting of dapsone. He had fever, exfoliative dermatitis and lymphadenopathy (cervical). Hemolytic anemia was present as evidenced by low hemoglobin, high reticulocyte count, suggestive peripheral blood picture and a high bilirubin (14.4 mg/dL with a direct fraction of only 6.7 mg/dL). Hypoalbuminemia present in our patient is also a feature of dapsone hypersensitivity , which is probably due to binding of dapsone to the circulating serum albumin . The patient had also received clofazimine for three weeks which was started simultaneously with dapsone. Could clofazimine have caused this constellation of symptoms? Theoretically, yes. As a part of hypersensitivity, or DRESS syndrome, every drug can cause hepatotoxicity. Also, clofazimine has been implicated in causing exfoliative dermatitis in a previous report by Pavithran . However, in our patient clofazimine does not appear to have caused these symptoms. Hepatotoxicity caused by clofazimine has not been reported in world literature whereas heptotoxicity caused by dapsone has been commonly described. Exfoliative dermatitis present in our patient is much more commonly seen with dapsone than with clofazimine (only one report ). Nevertheless, potential role of clofazimine cannot be excluded and hence both these drugs should be contraindicated in this patient. The patient had also received one dose of rifampicin which is unlikely to have caused such severe reaction. The hepatotoxicity caused by dapsone in our patient had certain unusual features as shown in liver biopsy (Figure 1). There was focal destruction of bile ducts and presence of intraepithelial neutrophils. These features are suggestive of cholangitis, which has not been previously reported in dapsone syndrome. Cholestatic hepatitis is a common form of drug-related injury and has been associated with numerous agents from almost all pharmacologic categories. 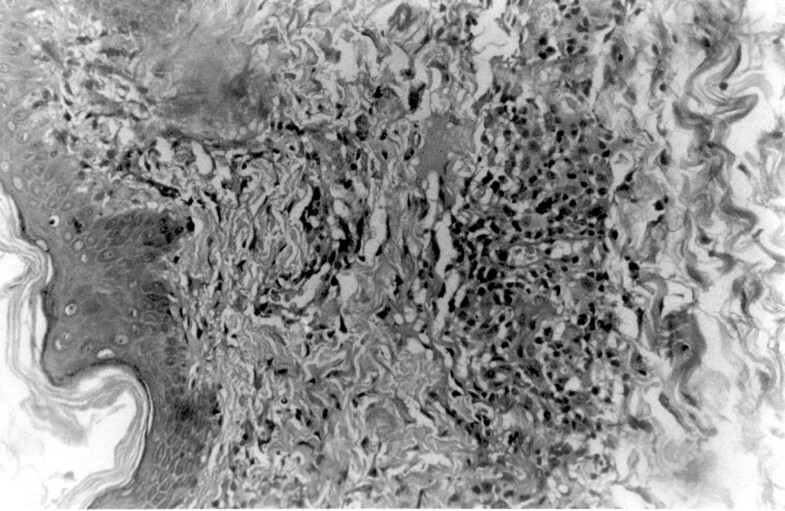 However, drug induced acute cholangitis is an unusual occurrence, characterized by infiltration of ductal epithelium by neutrophils and accompanied by varying degrees of epithelial damage or destruction. Lymphocytosis or eosinophils can join the infiltrating cells, and the affected portal tracts frequently demonstrate bile ductular proliferation with its attendant neutrophil response. Acute cholangitis is described with several agents, including allopurinol, carbamazepine, hydralazine and sulindac [21–24]. Our patient had cholangitis due to dapsone. In great majority of patients with dapsone hypersensitivity syndrome, liver biopsy is not performed, however the available literature suggest that the biopsy feature s of dapsone syndrome is either hepatitis, cholestasis or granuloma formation [9–13]. This is the first report of dapsone as a cause of cholangitis. Whether it is clinically relevant to distinguish between dapsone induced hepatocellular injury and dapsone induced cholangitis is yet to be established. In summary, we report a case of dapsone syndrome with an unusual hepatic manifestation. This is the first report of this syndrome with hepatic involvement in the form of acute cholangitis. With increasing usage of dapsone in leprosy, AIDS, and dermatitis herpetiformis, physicians should be aware of this unusual but serious adverse reaction of dapsone. Written consent was obtained from the patient for publication of study. SI and AK were the treating senior residents and GC was the consultant in-charge of the case. SD carried out the histopathological examination of the biopsy specimens. All authors read and approved the final manuscript.